These tables were made to go with the Fort's anniversary bed frame. 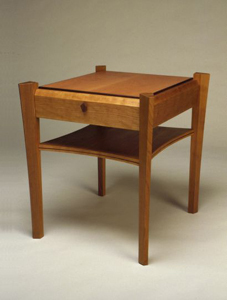 The legs are faceted and curved, similar to the bed frame. The top is made of Swiss pear wood with a granadillo border, and the lower cherry shelf is curved with a granadillo inlay on its edge. View the plans: top view, front view.